Those of you who know me, or who may have been following my posts know that I am a Google fan. I have been a supporter of Google+ since its launch and am happy to see that it is gaining success among big brands. That’s why I was so excited to see this article, which explains that Google+ is growing in popularity among top brands. 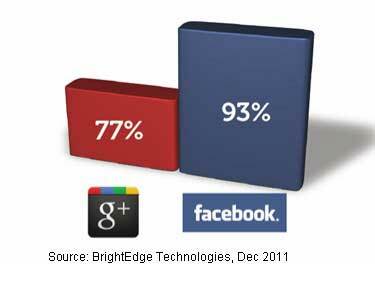 According to research conducted by BrightEdge Technologies, 77% of the Top 100 global brands had a Google+ page as of December 19. This is a 16% in just one month! By contrast, 93% of the Top 100 brands now have a Facebook page. What do you think about Google+? Are you a fan, too? Next Post Not ‘What’, but ‘Why’.